Does anyone remember that song ‘Everybody’s Free to wear Sunscreen‘ by Baz Luhrmann. If you haven’t go listen to it! It’s the perfect advice song to perk you up when you’re feeling a bit crappy. Even though, I’m only twenty eight – the lyrics make complete sense now. “If I could offer you only one tip for the future, sunscreen would be it. The long term benefits of sunscreen have been proved by scientists.” And on that note, sunscreen is so vital, I wear it every single day. 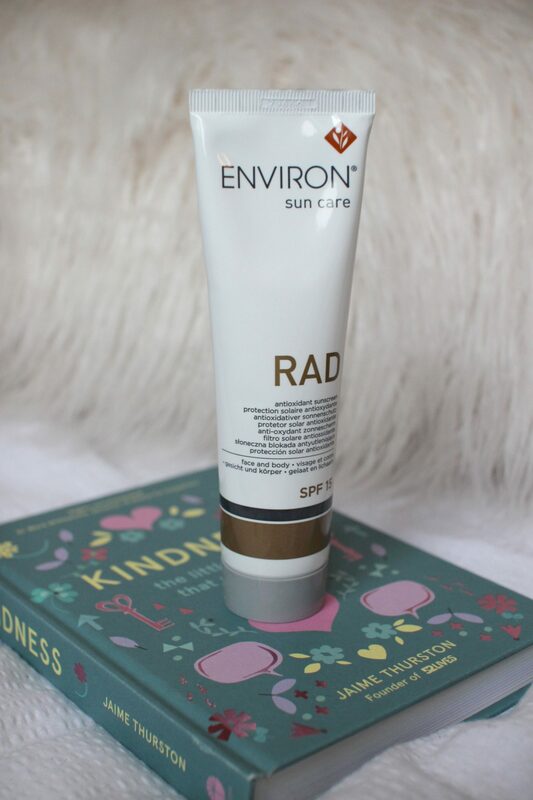 It’s in my Estee Lauder double wear foundation, as well as this I also use Environ’s RAD SPF 15 underneath for extra protection. Why is it so important? Your skin can be harmed by constant sun exposure and UV rays, whether or not you see a burn. Sunburn is an immediate reaction, but damage from the sun occurs over a lifetime. Sunscreen helps to prevent facial brown spots and skin discolourations and it slows down the development of wrinkled, premature ageing skin. It also helps to reduce the appearance of facial red veins and blotchiness. So it’s important to apply sunscreen every single day. Let’s get social. Connect with me on Instagram or Twitter. I’m also on bloglovin‘ follow me on there!